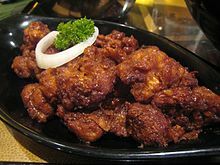 Gobi (cauliflower) Manchurian is the result of the adaptation of Chinese cooking and seasoning techniques to suit Indian tastes. It is believed to have been originally developed by a small Chinese community which lived in Kolkata for a century[when?]. In its two-stage preparation, the first stage requires preparing a spiced corn flour batter, dipping cauliflower florets in it and deep frying them. In the second stage, the deep fried florets are sautéed with chopped onion, capsicum, garlic, etc., in soy and chili sauce. It has no relation to Manchu cuisine or Northeastern Chinese cuisine. There are two different variants of gobi Manchurian, dry and with gravy. Both variants are prepared by using common ingredients like cauliflower, corn flour, maida flour, spring onion, capsicum, soy sauce, chili sauce, minced garlic, ground pepper, etc. and has typical garnish of spring onion. Some recipes call for use of monosodium glutamate (MSG) to increase the taste profile, though there are those who avoid it due to possible health issues. Its taste can vary from mild spicy to hot and fiery based on the recipe and personal preference. It has cauliflower fritters in comparatively dry sauce like texture and is typically served and enjoyed as a snack or starter with tomato ketchup as dipping sauce. It is popular among alcohol drinkers as a bar snack and can be found in almost all bar restaurants. It has cauliflower fritters in a thick soup like spicy gravy curry made of corn flour. It is generally served with varieties of rice dishes like steamed rice, Chinese fried rice, Szechuan fried rice, etc. in main course. ^ Laxmi Parida (2003). Purba: Feasts from the East: Oriya Cuisine from Eastern India. iUniverse. p. 191. ISBN 978-0-595-26749-1. ^ "Science suggests MSG really isn't bad for your health after all".